Jonathan’s response, though, made me think about what it actually means to be parallel. Often when you ask students, they will respond “two lines that never intersect,” which I usually push back against because 1) how do you know they never ever intersect? and b) skew lines never intersect, either. So when I explain parallel lines, I use the fact that they have the same slope/go in the same direction as the actual definition, which has the consequence of never intersecting. So I looked it up on Wikipedia. Every point on line m is located at exactly the same minimum distance from line l (equidistant lines). Line m is on the same plane as line l but does not intersect l (even assuming that lines extend to infinity in either direction). I don’t think statement 3 was particularly useful to me, but the idea of being equidistant was interesting. A vertically shifted parabola is not equidistant from the original – though they never touch, the distance between them gets smaller and smaller. 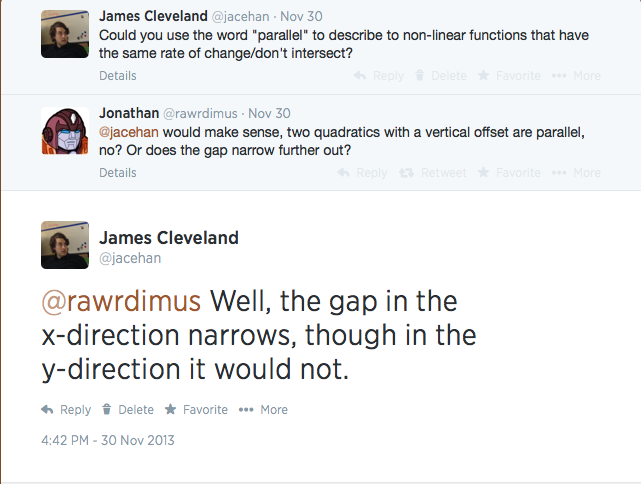 So that raised the next question – how do I actually measure the distance between two parabolas at a given point? 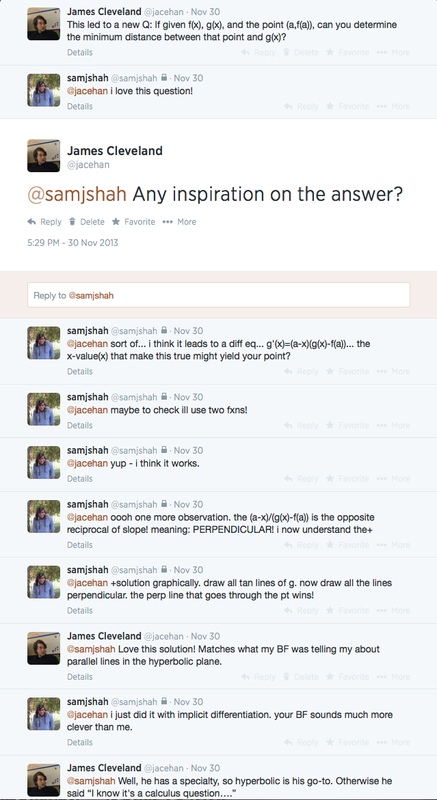 I asked my boyfriend and he responded, “Well, you definitely need calculus….” And who better to swoop in and help with that than Sam Shah. So now that I know how to find the minimum distance between two functions, all I need to do is find a function that whose minimum distance to my original function is constant, and then I should have something that you could call parallel. Lastly, I thought, well, what exactly is this function that I’ve traced? It looks kinda quartic, but that can’t be, because any quartic like this would intersect the parabola, right? So I tried to write the function for it, using parametric equations. Using , I made the parametric equation . I tried to plug that into Wolfram-Alpha to get the closed form, but it was a mess, so I still don’t really know what the closed form would look like. But who says a parametric form isn’t a solution?